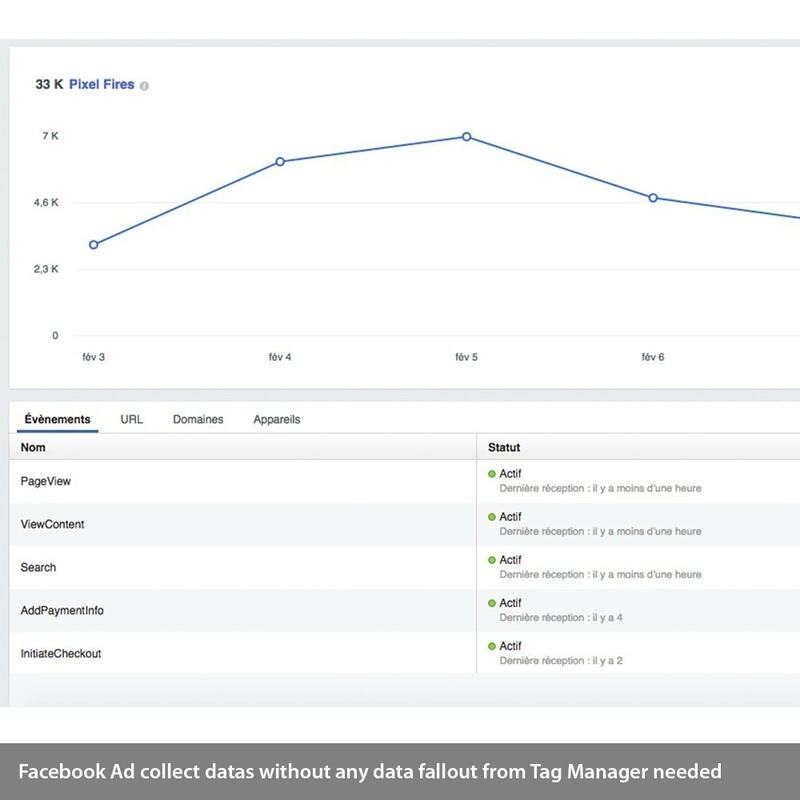 Allows to implement Analytics Enhanced Ecommerce via Google Tag Manager, Adwords remarketing & conversion tags, Facebook Ad event tracking and remarketings tags, and Bing ads tag. Especially designed for webmarketers ! Your shop is fastly growing and your are starting to sell more and more stuffs – that's a good deal ! Now is the time to take advatage of Analytics tools provided by Google, in order to have a better comprehension of your visitors behavior. Here you need to deal with enhanced ecommerce; and that's what this module provides. Implement simply and fastly a datalayer over your website's pages, and let it share some useful informations with Google Tag Manager. 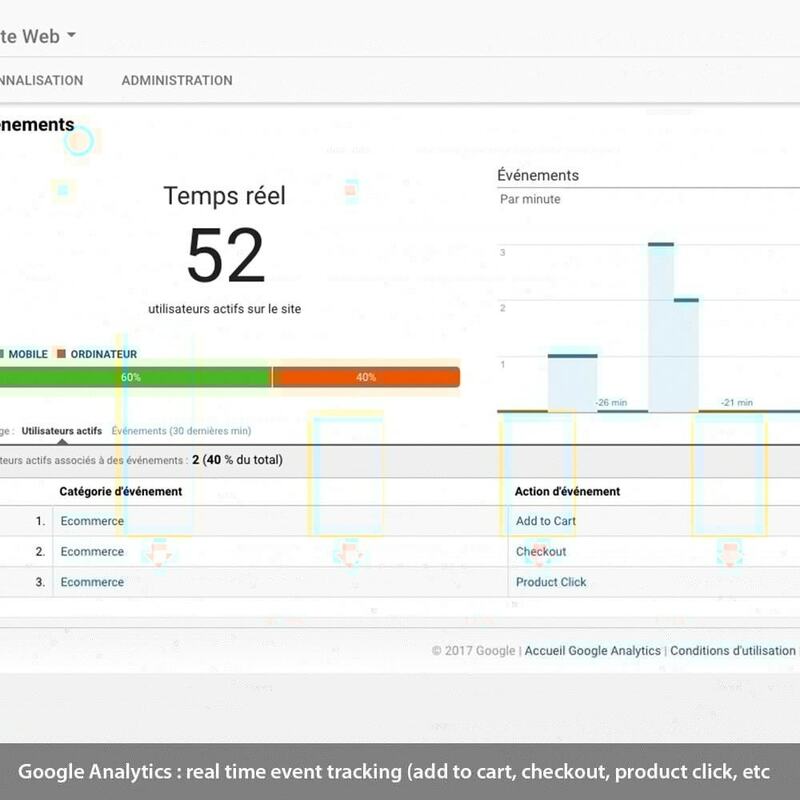 Now you are able to track a lot of events all around your shop : how many visitors are viewing your pages, how many product get impressions over your categories, clicks over your products and so on and so forth. Be also informated about products added to carts, evolutions of your internaut over the conversion tunnel or you shop, and of course about purchase informations. Webmarketers can now take advantage and check a lots of stuffs about their SEM and SEA campaigns, with the implementation of the Adwords remarketing tag all over the shop. 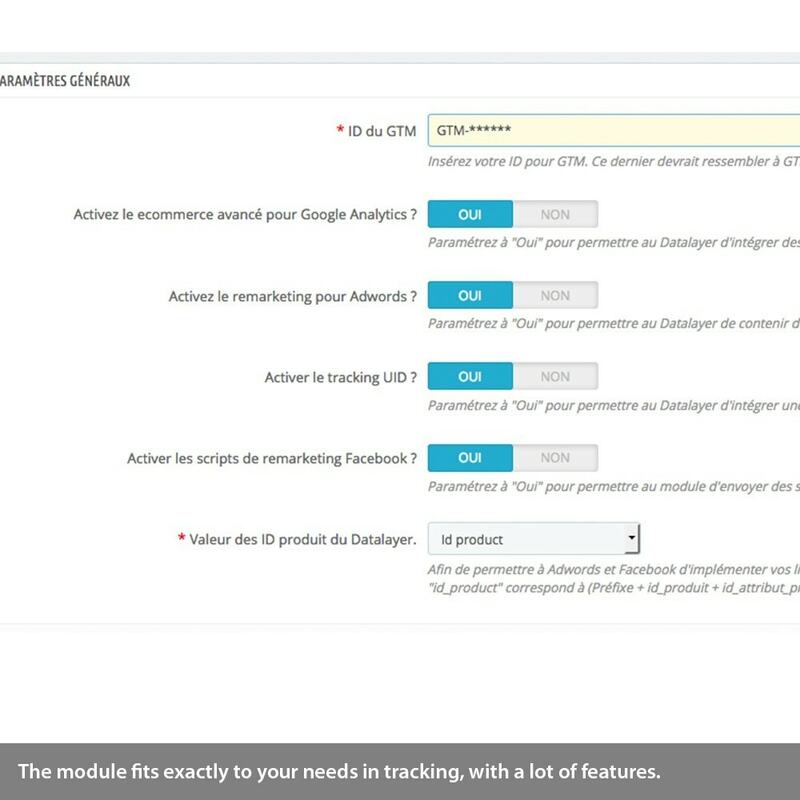 The module is also able to track purchases for Adwords, without any need of Analytics fallout. 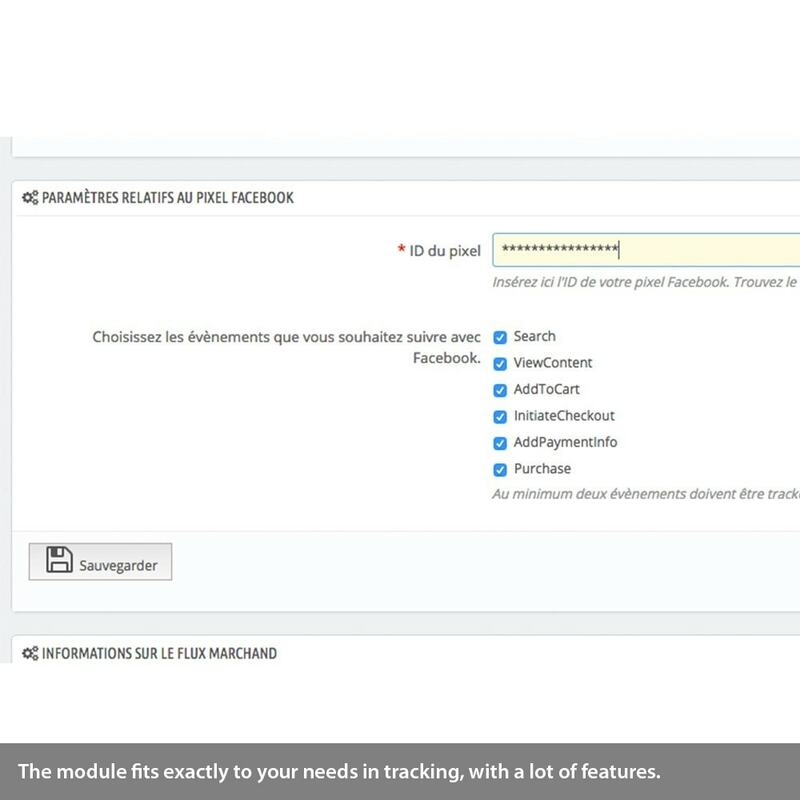 Cherry on the top, for those who want to start with SMO campaigns over Facebook Ad, the module affords you the possibility to track a lots of common events, useful to make your audiences lists grow – without any need of external configuration over Tag Manager. UID tracking (visitors cookie), allowing you to identify cross-devices visitors. 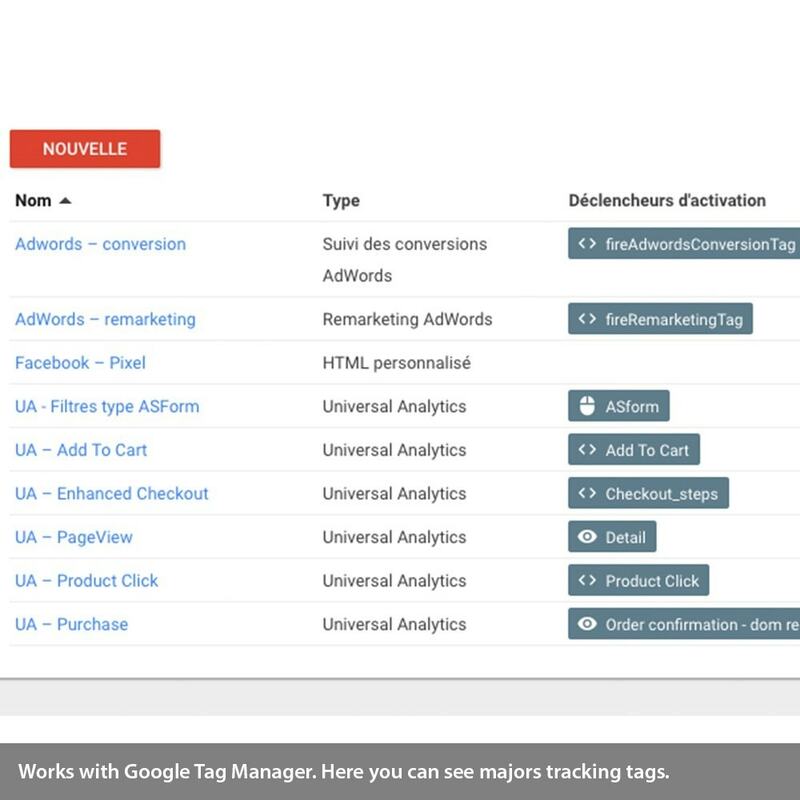 Purchase tag, to get a full fallout of your purchase on Adwords without waiting for analytics one. Choose whatever events you wanna track (PageView, ViewContent, AddToCart, InitiateCheckout, AddPaymentInfo et Purchase). New since V. 1.3.2 : Bing Ads conversion tag is now implemented (UET tracking) ! New since V. 1.3.3 : Bing Ads purchase tracking (conversion event). You are now able to analyse your visitors behaviors – and it informs you about the sticking points on your site. You are now more aware of your visitors needs, and you can launch more efficients marketing campaings. You are also able to implement some audiences list over Adwords and Facebook Ad. Let's deal with retargeting ad, reduce your campaings costs while making more money ! Owning a Facebook Ad account. Readme file explain how to edit and debug your tags over Tag Manager. Event added for product impression and detail.